As I write this, I am close to tearing up. 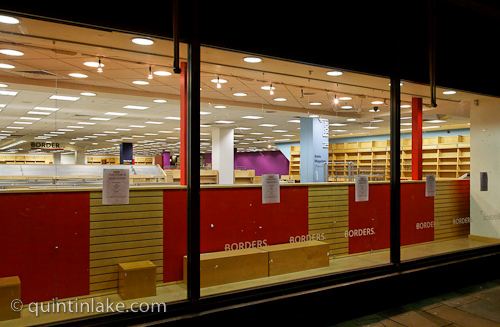 Borders bookstore will soon only be a memory in the minds of people across the world. To many of these it was just another shop, but to me it was more than that, and the recent announcement that Borders is to close in the USA has resurfaced my sadness. My first experience with Borders was on a visit to the States, and is actually where I got the book I talk about in my second Follow Friday post. I fell in love with the place because, at the time, I hadn't seen such an extensive book shop here in the UK. It was just so inviting with chairs you could sit in and read, magazines to browse uninterrupted, shelves and shelves of books, CDs and DVDs just waiting to be explored. I only wished that we had a store like this on our shores. It wasn't until a few years later on a visit with a few close friends that I actually discovered that there was a Borders in Oxford! I'd caught a glimpse of a small hanging sign a couple of years before, but as it was down a small alleyway I thought it wouldn't be on the same scale and didn't bother looking. Back then I didn't venture into Oxford much as it was unfamilar, but as my familiarity grew (and my confidence in the public transportation system), I began taking regular trips in, and spent hours inside at a time. A lot of my memories involve these close friends, who were were exchange students visiting for a few months and were discovering the city at the same time as I was. We'd always end up inside Borders as it was so near the bus stop, and also right in the heart of the main shopping centre. Of course, I'd visit the store with other friends too, including my particularly bookish friend who could spend as many hours browsing the shelves as I could. It was also a fantastic place to get newspapers and magazines from all over the world... I remember going all the way there just to get, ahem, Teen People every month/week/whenever it came out! Then my addiction to Starbucks flourished. What's better than the world's best coffee attached to the world's best bookstore?! Yup, Borders became a place of real comfort to me. And now we all must move without it. Even though it has been ages since we lost Borders here, I still hate walking past the Tescos Metro that now stands in its place in Oxford. I know it might sound dramatic, and there might be a few people rolling their eyes, but this is a heart-wrenching loss to me. Sure, in the UK we have other bookstores, and lately I've been avoiding chains and opting for second-hand and independent booksellers, but they're not the same at all. So thanks for all the memories and the comfort, Borders. This girl misses you very muchly! Nope, you're definitely not the only one! I really loved your post, Sophie! Naw, thanks Silvia :-)). I had no idea there was a Borders in Oxford Street! I think I've been living under a very large rock, LOL. Where abouts was it? I didn't even know we had a Borders here in UK...well you learn something new every day. This brings lots of sad memories. The very first time I "met" Borders was in Dublin in 1997. Then I "met" him again in 2004 when I was in Los Angeles. The fact that this chain was in London too, was the happiest thing I could possibly want. With my friend Silvia (first commenter of this post :P ) I used to spend hours in there, especially because of Starbucks. I noticed the first "signs" at the Oxford Street branch, and soon after, the same sign appeared at the Islington one. This happened a couple of years ago, and to be honest, I still feel an empty hole inside as no other bookstore can compete. Foyles rarely have discounts (and I haven't seen them yet) and Waterstone's (besides its 3x2), most of the times doesn't have the books I'm looking for. A very sad, sad, loss for all the bookworms out there. I also am so sad that Border's is officially going out of business-- I was there only a couple days ago (the one near my city was one that has stayed open so far) and when i walked in, there was a table set up with free mint frappacinos and cake because it was their anniversary, and now it just seems so sad that they're going out! I have a friend who mentioned this on FB the other day & was upset about it. Personally, I've only shopped at Borders once or twice in a mall a long time ago. Where we live now, Barnes & Noble or Half Price Books are more convenient. I love Half Price Books b/c of the deals too, but they aren't everywhere either. I do agree that it's sad when a favorite store closes though! At least I know that I can still get books elsewhere. Franny - are Foyles London based? I don't think I've seen one up here. Lea and Michelle - I visited B&N in Boston a few years back, but can only remember it vaguely. What I do remember though is that it was massive, and like Borders it had a DVD section, etc. I thought it was a pretty good store and also wondered, again, why we didn't have them here (pretty sure I won't discover one anywhere like I did with Borders though, lol). Blog now has a Facebook page! A Bit Of A Book Haul!